“To succeed, a social change campaign needs to have three attributes: content people want to watch, a community to support and amplify the video, and a call-to-action so that those who were moved by the content can help create change. If any one of these components is missing it’s an opportunity to improve. The social media aspects of the site play a big role in not just the community (sharing video) but also the content. What people sometimes forget is that YouTube isn’t just a one:many broadcast tool, it’s a conversation. When Invisible Children uploaded Kony 2012 it eventually reached 92 million+ views but just as amazing was that more than 40,000 videos were later uploaded about Kony – some in support of the campaign, others criticising. YouTube is a place where you get to hear multiple points of view and decide what you believe matters” – Hunter Walk (quoted in Har-Even, 2012). With the evolving nature of technology, social activism is no longer part of an underground rebellious culture, it is now mainstream and highly globalised through social mediums such as Facebook. However, social activist actions on Facebook are indicative of the new MTV generation. 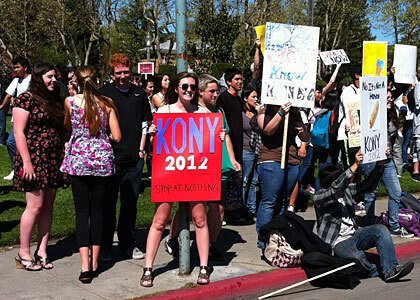 Kron and Goodman (2012) refer to this at armchair activism, or slacktivism, where the younger generation simply like or share the Kony video and they are part of the movement. Cronin-Furman and Taub further this notion in their article Solving War Crimes with Wristbands: The Arrogance of ‘Kony 2012’. ‘Invisible Children has turned the myopic world-view of the adolescent — “if I don’t know about it, then it doesn’t exist, but if I care about it, then it is the most important thing in the world” — into a foreign policy prescription’ (Cronin-Furman and Taub, 2012). Cavanagh (2012: 2) states that part of the success of the video was due to the fact that it was accessible, no longer were the issues only for the realm of professionals or experts, the narrative could understood by children. 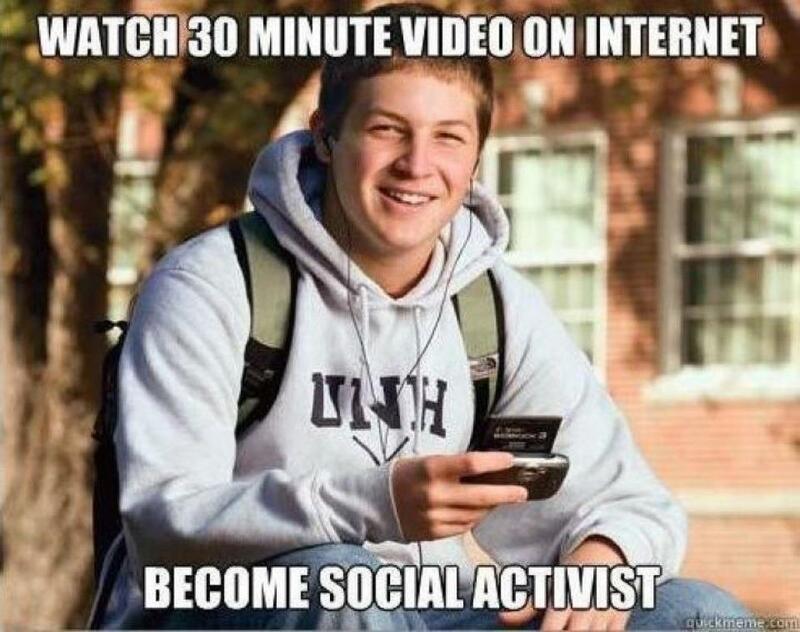 The video chooses a narrative in which youth can strongly relate to, utilizing existing knowledge on the Civil Rights Movement (Cavanagh, 2012: 2). Thus, when viewers click the ‘Share’ button and donate money ($30 for the Kony pack on the Invisible Children website) they are now co-producers of the campaign and not passive consumers of complex material generated by academics (Cavanagh, 2012: 2). Samantha Power (2002), in her book A Problem From Hell: America in the Age of Genocide highlights the failures by America and the West to intervene and prevent genocide and crimes against humanity. According to Power this is because leaders in America hold the belief that the public would not support their decision to get involved. In theory, awareness campaigns such as ‘Kony 2012’, should remedy this situation as it raises public knowledge. However, as Cronin-Furman and Taub (2012) highlight, these schemes can often backfire. Groups, such as the LRA, can be spurred on further to commit crime in order to cement their place or use scare-tactics towards the opposition. The example of the LRA, 2008 “Christmas Massacre” proves this point. In response to the attack by the Ugandan and Congolese government forces, which was supported by the U.S, the LRA killed 400 people and mutilated more on Christmas day (BBC News, 2008). Cronin-Furman and Taub (2012) further elaborate their point stating that the ‘Kony 2012’ campaign has reduced a highly complex situation into a simple issue which can be solved by buying wristbands and tshirts. The questions must be asked of ‘how do we go from raising awareness about LRA violence to actually stopping it? What’s the mechanism of transforming YouTube page views into a mediated political settlement?’ (Cronin-Furman and Taub, 2012). “We know what to do. Here it is, ready? In order for Kony to be arrested this year, the Ugandan military has to find him. In order to find him, they need the technology and training to track him in the vast jungle. That’s where the American advisors come in. But in order for the American advisors to be there, the American government has to deploy them. They’ve done that, but if the government doesn’t believe the people care about Kony, the mission will be cancelled. In order for the people to care, they have to know. And they will only know if Kony’s name is everywhere” (Kony 2012, YouTube). One of the major criticisms of ‘Kony 2012’ is the neo-colonial nature of the campaign (Flock, 2012). According to Blattman (2009) the video not only hints at the idea of the ‘White mans burden’, it shapes ‘Kony 2012’. The savior attitude throughout the campaign has been persistent, with Americans led to believe they can make up for past mistakes (see The MTV Generation and Social Activism). Glenna Gordon insists that Invisible Children are actively creating an myth for Americans to buy into, just like a marketing campaign for a product (Flock, 2012). However, it is important to note that Invisible Children is a business and a film company, not an aid provider or a charitable organization and many Africans at the grassroots levels feel that the campaign has dis-empowered their voices (Blattman, 2009). This is due to the fact that during the video no Africans or Ugandans offer policy suggestions, and it is inadvertently implied that the local government has made no progress in combating Joseph Kony or the LRA (Cronin-Furman and Taub). Furthermore, with the reductionist nature of the film people in conflict are put into two broad categories, first, mass-murderers like Jospeh Kony, and second, helpless victims who are passive and need saving (Cronin-Furman and Taub). Blattman, C. 2009 Visible Children, http://chrisblattman.com/2009/03/04/visible-children/, 08/10/2012. Cavanagh, C, J. 2012 Kony 2012 and the political economy of conflict representation, Department of International Environment and Development Studies, Norwegian University of Life Sciences, unpublished. Cronin-Furman, K., Taub, A. 2012 Solving war crimes with wristbands: The arrogance of ‘Kony 2012’, http://www.theatlantic.com/international/archive/2012/03/solving-war-crimes-with-wristbands-the-arrogance-of-kony-2012/254193/, 08/10/2012. Flock, E. 2012 Invisible Children founders posing with guns: an interview with the photographer, http://www.washingtonpost.com/blogs/blogpost/post/invisible-children-founders-posing-with-guns-an-interview-with-the-photographer/2012/03/08/gIQASX68yR_blog.html, 08/10/2012. Kron, J., Goodman, D. 2012 Online, a Distant Conflict Soars to Topic No. 1, http://www.townshipschools.com/userfiles/1122/Classes/66216/NYTimes%20-%20Distant%20Conflict%20No%201.pdf, 08/10/2012. Power, S. 2002 A Problem from hell: America in the age of genocide, Basic Books: New York.